1Peter 4:1-11 – What Really Matters! So then, since Christ suffered physical pain, you must arm yourselves with the same attitude he had, and be ready to suffer, too. For if you have suffered physically for Christ, you have finished with sin. 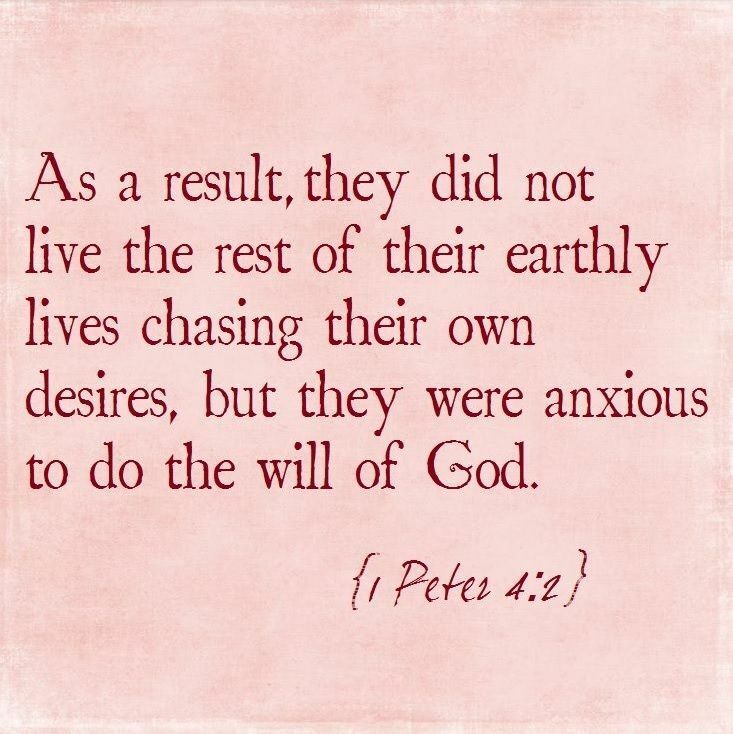 2 You won’t spend the rest of your lives chasing your own desires, but you will be anxious to do the will of God. 3 You have had enough in the past of the evil things that godless people enjoy—their immorality and lust, their feasting and drunkenness and wild parties, and their terrible worship of idols. 4 Of course, your former friends are surprised when you no longer plunge into the flood of wild and destructive things they do. So they slander you. 5 But remember that they will have to face God, who stands ready to judge everyone, both the living and the dead. 6 That is why the Good News was preached to those who are now dead—so although they were destined to die like all people, they now live forever with God in the Spirit. After reading these verses, I wrote these words in the margin of my Bible – “Make your life about this – this is what really matters”. When I experience suffering, does my attitude and behavior reflect that I am willing to suffer as Christ suffered? 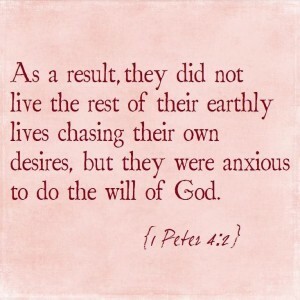 Am I anxious to do God’s will? Am I eager to participate in ungodly behavior? How can I be more earnest and disciplined in my prayer life? In what ways am I showing a deep love to others? Who do I need to show a deep love to? Is there someone that I am choosing not to show a deep love to? Who can I invite into my home for a time of coffee conversation, meal sharing, or place to stay? Am I using my spiritual gifts and talents as a service to the Lord? Is there a job that God needs me to do? Who, in my daily life, needs to see the love of Christ shown to them in a tangible way? I so love how Peter ends these verses – “Do it with all the strength and energy that God supplies”. I so need to be reminded of this each and every day! It is incredibly easy to get caught up serving and loving people in a way that is all about yourself and done in your own strength. We have to daily take time to pray and seek God for His will in how we love and serve. As we seek His face, He will provide the necessary strength and wisdom we will need to accomplish the things He calls us to do. As you look at these verses, what changes do you need to make to live life in the way that really matters? Have a grace full week living to do His will! Good stuff Kath! Thanks for the thought provoking words and challenge to be honest with ourselves. Thanks for sharing how this blog ministered to your heart! What a spiritual breakfast to feed my soul and spirit. I especially am drawn to the same verses. Thank you! See you in the summer sweetie! Love how you put this! Looking forward to seeing you some time this summer! These words spoke to me and cause me to do a mental inventory of where I am as regard to my attitude towards serving. It’s good to reflect on your reasons every chance you get to make sure you are lining up with the word of God. Enjoyed this check-up. Thank you Catherine for sharing your heart.